I always have so much trouble getting back into blogging when I've taken an accidental break. This post will simply be to play catch up and then hopefully blogging won't seem so daunting. I have quite a backlog of things to share, despite the fact that I have spent the majority of my knitting time these past couple of months knitting samples for designers. I moved to a new apartment at the beginning of June and still feel like I haven't fully settled in or unpacked, but I'm growing accustomed to the new place. I now have internet at home (this hasn't happened since 2010) so it will make blogging easier, I hope. For today, though, let's just do a quick update. Way back when there was still snow on the ground (which was much more recently than I care to remember) I finished another pair of socks for myself. Please ignore my ghost-white Minnesota-winter legs. This pair is part of my initiative to only wear handknit socks in the winter. I hate making them, but love wearing them. 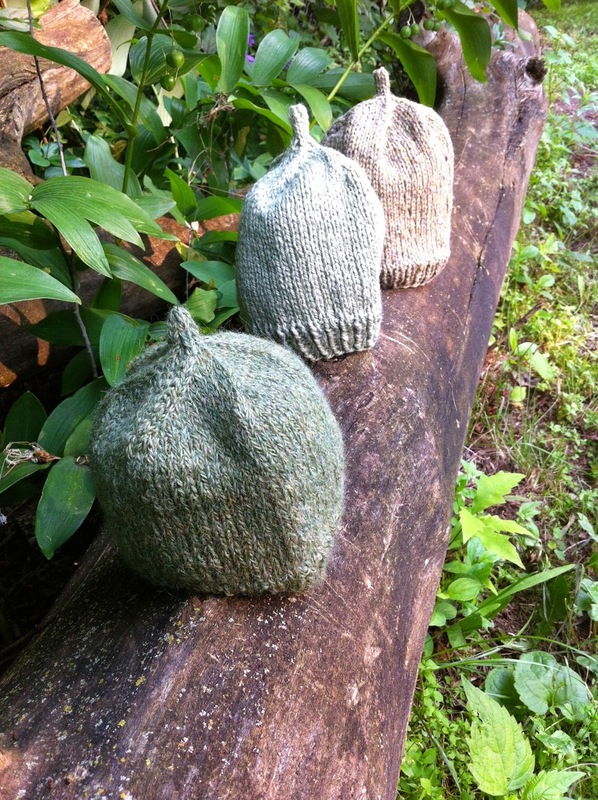 I'm hoping to crank out another few pairs before the cold sets in again. One of my best friends is pregnant with her first child, so I wanted to be sure the little guy would be equipped with a nice blanket when he arrived. The due date was this past Sunday, but he still hasn't made an appearance. The colors of the yarn are so vibrant, I'm really happy with how the blanket turned out. I finished it several months ago and it has been on display at the yarn shop ever since, but I took it back yesterday so I could give it a good wash and send it out to my friend in Seattle before too long. My friend also sent me a picture of a baby hat and asked if I could make a similar one for their newborn photo shoot. I made three, just in case. They requested sage green and because I'm colorblind, I thought I would give them options. Also, I have no idea how large a baby head is, so I guessed. Hat 2, Fibre Co. Savannah. Now, despite all the samples I've been making, I have somehow also found the time to get sucked down the rabbit hole of a few other (somewhat related) crafts. Crochet anyone? Yes, I am making a giant granny square. This is the first time I've ever really crocheted anything and it's sort of mind-numbing in a good way. I'm using Shetland Spindrift in about 30 different colors and I love the way it's coming out. I've added a few dozen rows since that picture was taken. There are actually about eight of us at the yarn shop making this blanket together as a sort of crochet-along. It's fun to see everyone's progress every week and we've all chosen such different color palettes. Crochet is a great way to play with color because it combines them in a way that knitting doesn't. Planning the color sequence is just as enjoyable as actually crocheting the piece. 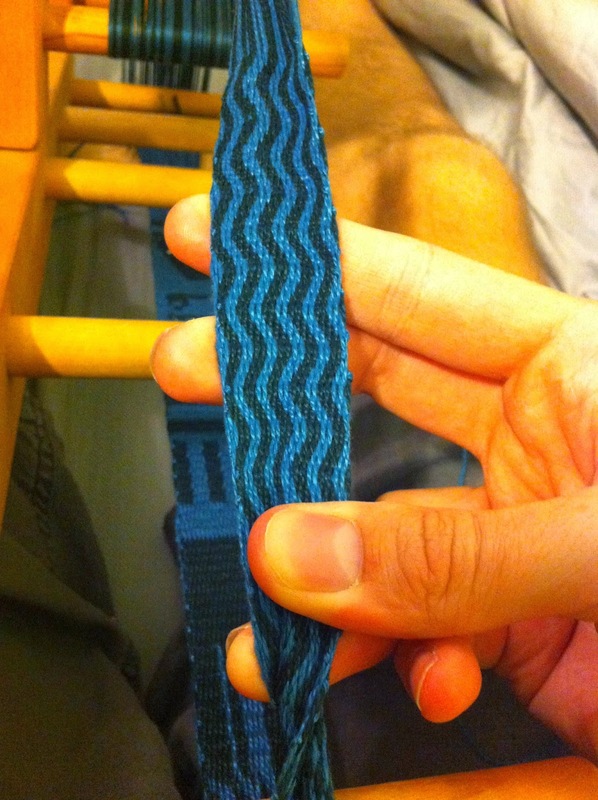 And as if that's not enough to fill my time, I've also become oddly interested in card weaving. That's the first band I made. I really just threaded the cards to play around with it and came upon this pattern by accident. You can see in the background a bit of the random patterning I was trying out before I came upon this one. I just realized I don't actually have a picture of the cards that you use to weave with, but the technique itself is used to create narrow, strong bands. For what? Who knows. I don't have a plan, but it's fun to explore the possibilities. And it's FAST, too. 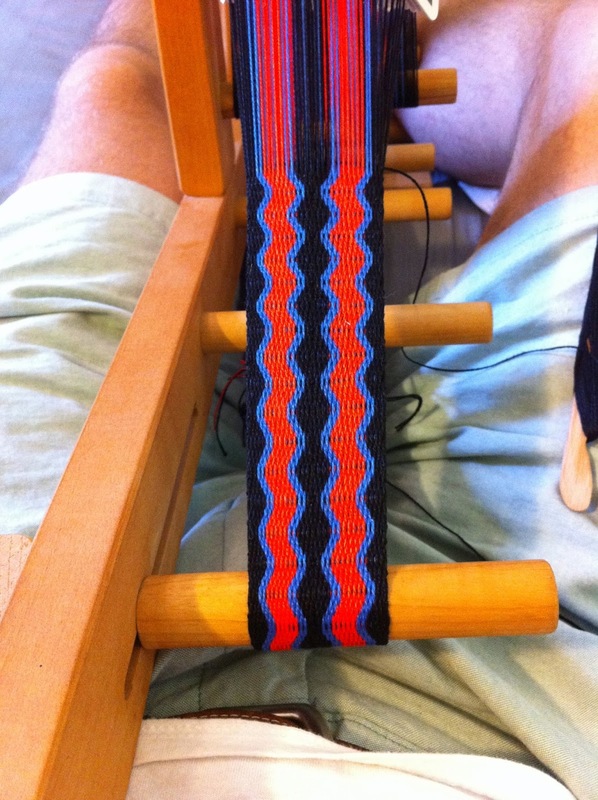 I'm able to weave several feet in just a few days. It's definitely one of those instant gratification projects. 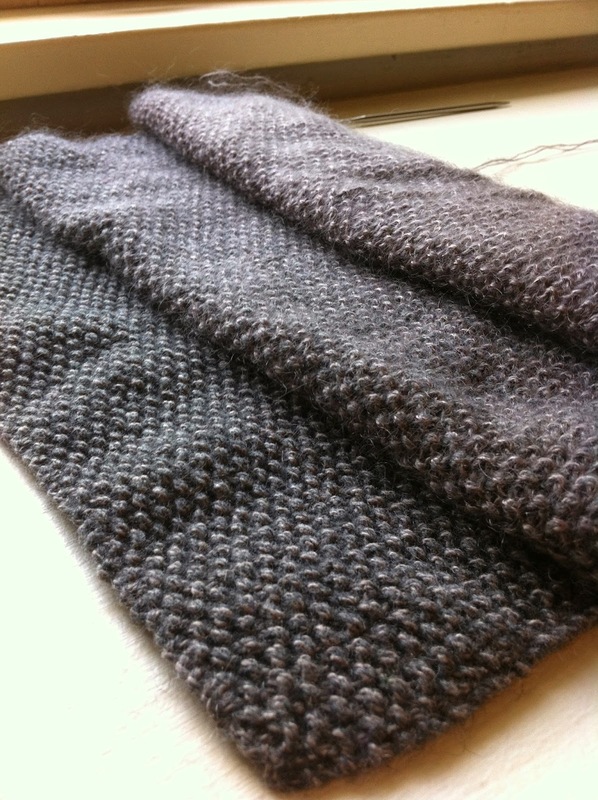 And if I really want to relax, I pick up my Multigrain Scarf from Shibui. They sent me the yarn and pattern as a way to explore the "Shibui Mix" concept - holding multiple yarns together to create different fabrics. This scarf uses Pebble, Silk Cloud, and Cima. In the above picture you can see Pebble held double on the left (cashmere, silk, and wool), then 1 strand of Pebble and 1 of Silk Cloud in the middle, then Silk Cloud held double on the right. (Silk Cloud is similar to Kidsilk Haze, only better in my opinion.) It then progressed to Silk Cloud/Cima, Cima doubled, Cima/Pebble, and then Pebble doubled again. Every time I pick up this project, I feel all of my stress melt away. It's an incredibly indulgent project and there is no way I could possibly work with these fibers while remaining tense. It's just impossible. I'm using the same color (Mineral) for all of the yarns, but changing the combinations adds an interesting dimension to the texture of the scarf, despite the fact that the gauge remains the same. It's a fun concept to explore and customers at the yarn shop have been falling in love with the different fabrics you can produce. So there you have it, that's what I've been up to on top of knitting sweater after sweater after sweater (and working two jobs). There are potentially some very exciting changes coming up in my near future, but more on that later. Take care! Well, it's always a pleasure to read you. So nice to hear from you again - always a joy to hear what you have been up to. Can't wait for the next one! Gah! Everything looks amazing and squishy and fun. The baby blanket is so cheery! I hope your friend sees what an awesome gift it is. Nice to see that you are back on the blog. Your work is inspiring as always. I smiled when I saw that you are doing crochet and card weaving - you are such a fast learner! This year I have tried tapestry crochet and weaving, both are interesting experiences. 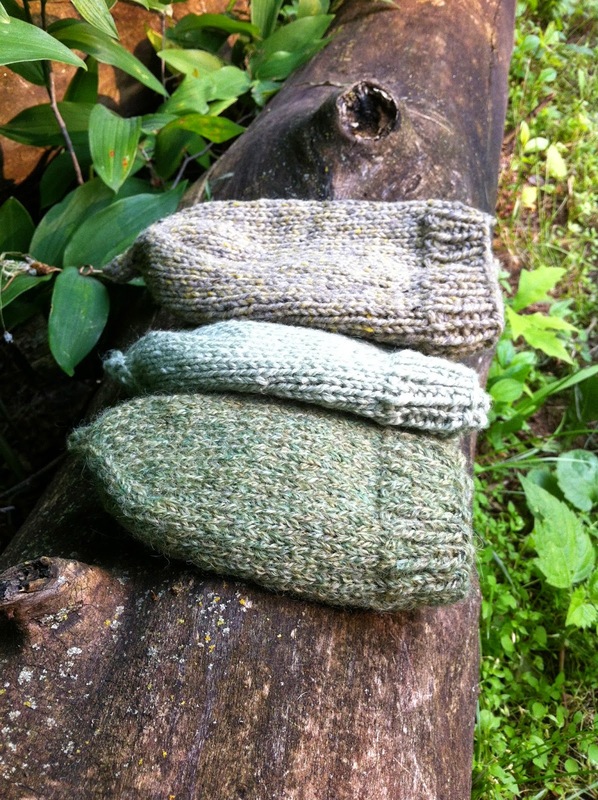 I need to get back into a sock groove myself (my daughter just moved to Wisconsin and I'd love for her to have warm feet this winter) and love the progress shots of your Mix. You've certainly tempted me to try one myself!